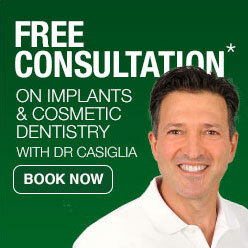 Are you unhappy about the appearance of your smile? Would you like to benefit from the self-confidence boost that comes from showing off a complete, straight, beautiful smile to the world? If so, cosmetic dentistry treatments from Apple Dental could be the answer! From our comfortable practice in Lane Cove, the Apple Dental team can provide you with the highest quality cosmetic dentistry treatments, from simple one-hour teeth whitening, dental implants, or dental veneers, to complete smile makeovers and full mouth restorative procedures. All our team are motivated to do their best work by seeing the incredible difference cosmetic dentistry makes for our patients. In our experience, even a seemingly subtle change or minor procedure can have a hugely beneficial impact on our patient’s self-confidence, social interaction, and professional development. Your journey towards the healthier, more attractive smile you’ve always wanted begins with a personal cosmetic dentistry consultation with our experienced, knowledgeable team. At our inviting practice in Lane Cove, together you and the Apple Dental team will create an individual treatment plan for your smile, combining the latest modern cosmetic treatments to create the ideal outcome just for you. Cosmetic or aesthetic dentistry is the broad heading under which many dental procedures that improve the appearance of your teeth. The Apple Dental team uses modern dental technology to give you a range of options for correcting stained, dark, chipped, or crooked teeth, or restoring missing teeth. Can you close a space between my two front teeth? Yes, we have several options for improving your smile. Dental bonding can correct discolouration and shape of your teeth in just one visit. Porcelain veneers can improve the colour and shape of your teeth in two visits to Apple Dental, or we can create an orthodontic treatment plan to give you a beautiful straight new smile. 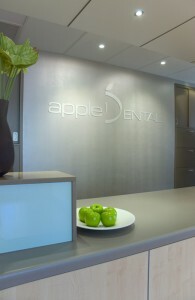 A consultation with the Apple Dental team will enable us to determine the best treatment plan for you. Can you treat a crooked smile? If you do not wish to have a full orthodontic treatment, we can prescribe alternative procedures such as dental bonding, porcelain veneers or full crowns to create an aesthetic new smile. Will a replacement crown match my natural teeth? We will carefully match the colour and contour of your adjacent teeth, to ensure your smile looks just as natural as it did before getting the crown. Can you treat a “gummy” smile? Yes. The Apple Dental team can use laser dentistry to easily and painlessly correct a gummy smile in most cases, to help you achieve a more beautiful, healthy smile. If you want to understand Cosmetic Dentistry a bit more, please contact our friendly Apple Dental team on (02) 9420 5050. Our practice address is 1 Finlayson St Lane Cove NSW 2066.